Before deciding to return to full-time education I read a number of blogs by mature students. Many of these were written by students in their 30s, which by my standards is not so mature. My dissertation in 1983 was produced on a typewriter a full 6 years before Tim Berners-Lee wrote his proposal for what would later become the World Wide Web. So this is the diary of a very mature student. I have always loved politics. As a sixteen year old I joined the Labour Party Young Socialists in Swindon, not exactly PPE at Oxford but it was the start of my political education. I went to meetings with Trotskyist activists and pretended to understand Marx's theories of surplus value and dialectics. I was enthused by campaigning, even leafleting, but experienced political defeat early when Margaret Thatcher won the 1979 election. I never expected to go to University but I was accepted through clearing, after a teacher encouraged me to apply (bless you Bob wherever you are) and I studied Politics and Economics from 1980 to 1983. I don't think I ever really expected to go back to university but I love learning and I was inspired by my children, who have both completed Masters degrees. I walked the Inca trail with my daughter earlier this year and enjoyed talking to her about her experience as a mature student. I had recently sold a company I co-founded and had the opportunity to take a year out from working, so the timing was good. I also believe Gandhi had it right: "Live as if you were to die tomorrow. Learn as if you were to live forever." Today as I walked around the LSE campus I felt the same thrill and trepidation I felt back in 1980 when I first set foot in a university. There is something about the first time you enter the students union, the library and a lecture theatre, that remains indelibly etched somewhere in your emotional memory. A number of people have asked me to write a blog or diary of my experiences as a more mature student. So here is my week zero blog post where I reflect on the process so far. Today I met my fellow students for the first time at registration. I thought it might feel a bit odd, however, despite being a good thirty years older than most of them it felt completely natural (at least to me). We talked about the course, where we came from, what we had done before and we also talked politics. I think there are just three of us from the UK, though I haven't met everyone yet, and it was wonderful to meet people from Peru, Germany, Canada, France, India, Italy, Norway, Spain, America, and Portugal. It is a really international group and I look forward to learning from them and getting their perspectives on politics. As I listened to their stories of flat hunting I felt very privileged. I have been lucky to earn, and save enough, through my 35 years of working to own a house in London and not worry about the costs of accommodation. I was unsure about my chances of securing a place on the MSc course having been out of education so long. I pitched how my work experience was relevant to the course, my passion for politics and my posts on this blog. It will be interesting to find out if they actually read them. For me blogging is a form of learning out loud and I have blogged continuously on various blogs since the early days of the internet. I would like to think it helped me in some way. The application process was conducted online, which involved uploading various forms and documents. I also had to contact my former university for something called a transcript, which had a record of the modules I undertook back in 1983 and my grades. Surprisingly to me they still had a copy, which was probably as well as I couldn't find any of my certificates. I think it took five or six weeks before I received a letter saying I had been successful. All the administration was managed through a site called LSE for You and a series of emails. 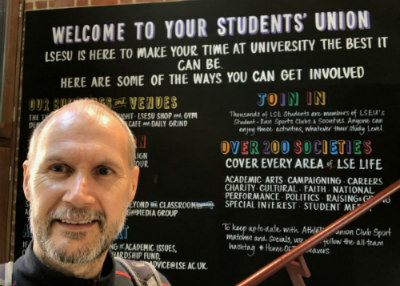 There seemed to be a lot of admin, for example, completing the offer acceptance form, completing the financial undertaking, paying the fees, reviewing course modules, setting up my LSE email, checking all the various mails for dates of registration, welcome lectures etc. There are still things I haven't worked out, for instance why my email login doesn't also work on the Library site or the Moodle learning management system as it is supposed to but hopefully I will get this resolved next week. Like everything else in life these days it is an online self-service process. My first tip is once you have your student email you should cancel your existing Amazon Prime membership and sign up again as a student to get 6 months free. You also get 10% off text books as a student on Amazon. The best thing I did was join the Departmental Facebook group, as through this group I made contact with other students on my course over the summer. One of the students Ben, set up a Messenger group, which has been very useful and a place where the 27 of us can chat, share and ask questions. I am familiar with Slack and other online tools, as well as being active on social media, so this wasn't so much of a shock to me but I am conscious that language and style on messaging apps can reflect your age. I suspect for other mature students that are less familiar with technology and social media it may be more of a challenge. That said I still missed the LSE postgrad Facebook group and hence a number of events I wanted to attend. Another tip would be to check out all the relevant Facebook groups and explore the University and Student Union society events pages. There are many interesting events but many fill up very quickly. I have already learnt my lesson and booked into events through to Christmas. The LSE site lists all of the modules that can be taken as part of the course, along with details and a suggested reading list. Being keen, and conscious I hadn't studied for a while, I purchased a batch of books to read. Prior to purchasing I searched for books as PDFs on Google and managed to get hold of quite a few books in PDF form. Amazon's pre-owned books option was also very useful as I managed to get a number of books cheaply. Some of the more recent books I have downloaded instantly on my Kindle. The speed with which you can access information and materials is something we would never have dreamed possible in 1980. Back in my day I remember the struggle to get hold of popular textbooks from the library and the black market in photocopied journal articles. What I would have given then to simply be able to search for, and read, a journal article without leaving my desk. As part of my preparation I have browsed relevant journals, read recent articles and saved off some of the more useful ones where I could. These days it is relatively easy to search and find lectures on YouTube. I have watched quite a number as background preparation. I have also discovered podcasts which are wonderful. There are many great political science podcasts which I listen to while walking or in the gym. They range from guest lectures at universities to interviews to reviews of political science books. There are some truly great free resources. This week I spent a day watching a YouTube video series covering topics such as linear regression, which I now think I understand far better than I ever did before. I am conscious that academic reading is different from reading political books for pleasure. Knowledge is layered over many years through theories, concepts and research. Thus I try to make notes about these specifically and often google a theory or concept to get a quick overview when they arise in the literature. At university I had masses of hand written notes, often illegible, in various files and folders. Now I have no hand written notes. I make notes in Google docs and have a google drive neatly ordered into folders with copies of my notes, PDF journal articles and PDF books. I have found two things to be very helpful. The first is a book stand, which allows me to read textbooks without holding them and to make notes as I read. The second is using Google voice to make notes. Sometimes, cognitively it is good to type up notes but I find it very quick to use Google voice to dictate notes straight into my Google docs. 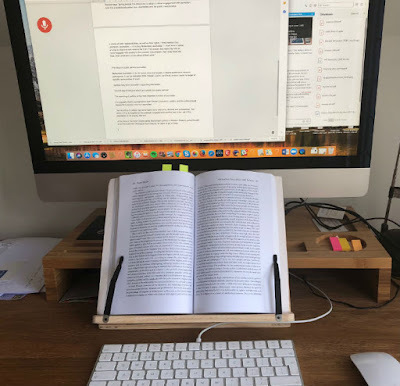 I have also forced myself to write up brief book reviews and research reviews on this blog as part of my learning and to get back into the habit of writing in a slightly more academic style. I don't properly reference everything, something I need to learn, but I think it has been helpful. Whether I will have the time to continue once the course starts we will see. It may not be for everyone but I can recommend writing up some of your notes as blog posts. It is not the same as writing an essay of course, as you have limited time to write blog posts. I feel they are always a work in process and it is inevitable you will make errors and typos. However, there is something about the public nature of posts which makes you more focused and accountable. At least for me. It feels as though a whole new world is opening up to me. As I browsed the bookshop and library today I wanted to read almost everything I came across. My main worry is there are not enough hours in the day to read everything I want to read. I am already one of those people that speed up their podcasts to 1.5x so I can get through them quicker. There just feels like so much I need to read, I am jealous of my fellow students who have spent three years studying political science. I feel I need to cram three years reading into three months. I do worry whether I can absorb and retain everything. 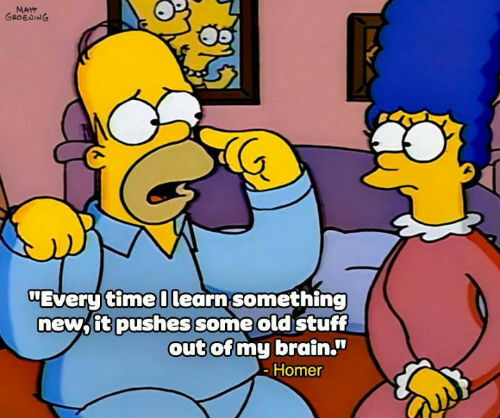 I currently feel like Homer Simpson who said "Every time I learn something new, it pushes some old stuff out of my brain." I am also nervous that I lack an academic approach. In my previous work I would often extract a million articles from our database of the most shared web articles and analyse them, just to see if I could find out interesting things. For example my research on headlines that work. Already from my limited reading I realise my research wasn't based on an hypothesis, a review of previous literature or theory. I was what I believe academics would call a naive empiricist. I have a lot to learn and a world to explore.